Tirzah in 1889 photo; age 34. 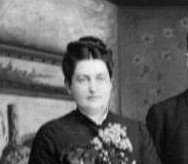 15197.661 Tirzah 8BIGELOW, dau of Daniel 7 ( Jotham 6 , Joel 5 , Jotham 4, John 3, Samuel 2, John 1) and Ann Elizabeth (WHITE) BIGELOW, was born at Olympia, Thurston, WA on 21 September 1855. Her marriage was to Miller G. Royal on 19 August 1877. He was born in Roop county, MI on 06 October 1853 and died on 10 January 1914. He is buried in Prospect cemetery, Olympia. Tirzah died on 14 December 1927 and also is buried in Olympia. 15197.6612 Bonney Adnah Royal, b 12 Dec 1884; d 19 Aug 1944; m 07 Sept 1911 T. Charles Gaastra; 1 dgtr. 15197.6613 Vera A. Eola Royal, b 21 Aug 1886; d 04 July 1891. I am the grandaughter of the late Vera Royal (Hardman) Hayduk and am seeking sources for family history.